A richly flavored chocolate icing or filling made from chocolate and cream blended together over low heat until the chocolate has melted and can be mixed with the cream. The chocolate mixture is allowed to cool and stiffen at room temperature so that it can be whipped to increase its volume. Typically made with equal amounts of semi-sweet chocolate (white or dark chocolate) and cream, a Ganache can also contain different proportions of chocolate and cream in order to create a stiffer or softer result. Adding more cream decreases the stiffness while adding more chocolate increases it. 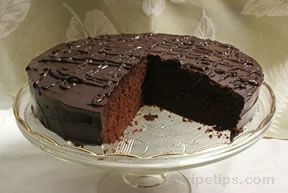 When the Ganache is spread or poured over cakes, tortes, and pastries, it is prepared as a glaze. 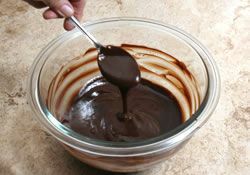 If it is made as a filling for baked desserts, the Ganache is served in cookies, cakes, tarts, and soufflés. It can also be used for making truffles where the preparation becomes the rich chocolate filling so memorable in this popular candy.